2O. It is an oxide of nitrogen. At room temperature, it is a colourless, non-flammable gas, with a slightly sweet odour and taste. It is used in surgery and dentistry for its anaesthetic and analgesic effects. It is known as "laughing gas" due to the euphoric effects of inhaling it, a property that has led to its recreational use as a dissociative anaesthetic. It is also used as an oxidizer in the launching of rockets and in motor racing to increase the power output of engines. At elevated temperatures, nitrous oxide is a powerful oxidizer similar to molecular oxygen. Nitrous oxide gives rise to health system. Nitrous oxide can be used as an oxidizer in a rocket motor. This has the advantages over other oxidisers in that it is not only non-toxic, but also, due to its stability at room temperature, easy to store and relatively safe to carry on a flight. As a secondary benefit it can be readily decomposed to form breathing air. Its high density and low storage pressure (when maintained at low temperature) enable it to be highly competitive with stored high-pressure gas systems. In a 1914 patent, American rocket pioneer Robert Goddard suggested nitrous oxide and gasoline as possible propellants for a liquid-fuelled rocket. Nitrous oxide has been the oxidiser of choice in several hybrid rocket designs (using solid fuel with a liquid or gaseous oxidizer). The combination of nitrous oxide with hydroxyl-terminated polybutadiene fuel has been used by SpaceShipOne and others. It is also notably used in amateur and high power rocketry with various plastics as the fuel. 2O will decompose exothermically into nitrogen and oxygen, at a temperature of approximately 1070 °F.http://spg-corp.com/nitrous-oxide-safety.html Because of the large heat release, the catalytic action rapidly becomes secondary as thermal autodecomposition becomes dominant. In a vacuum thruster, this can provide a monopropellant specific impulse (Isp) of as much as 180 s. While noticeably less than the Isp available from hydrazine thrusters (monopropellant or bipropellant with nitrogen tetroxide), the decreased toxicity makes nitrous oxide an option worth investigating. 2O at 130 psi a 2500-joule ignition energy input is insufficient. sp greater than 300 seconds, while avoiding the toxicity associated with hypergolic propulsion systems. The low freezing point of NOFB eases thermal management compared to hydrazine and dinitrogen tetroxide—a valuable property for space storable propellants. In vehicle racing, nitrous oxide (often referred to as just "nitrous") allows the engine to burn more fuel by providing more oxygen than air alone, resulting in a more powerful combustion. The gas itself is not flammable at a low pressure/temperature, but it delivers more oxygen than atmospheric air by breaking down at elevated temperatures. Therefore, it is often mixed with another fuel that is easier to deflagrate. Nitrous oxide is stored as a compressed liquid; the evaporation and expansion of liquid nitrous oxide in the intake manifold causes a large drop in intake charge temperature, resulting in a denser charge, further allowing more air/fuel mixture to enter the cylinder. Nitrous oxide is sometimes injected into (or prior to) the intake manifold, whereas other systems directly inject right before the cylinder (direct port injection) to increase power. The technique was used during World War II by Luftwaffe aircraft with the GM-1 system to boost the power output of aircraft engines. Originally meant to provide the Luftwaffe standard aircraft with superior high-altitude performance, technological considerations limited its use to extremely high altitudes. Accordingly, it was only used by specialized planes like high-altitude reconnaissance aircraft, high-speed bombers, and high-altitude interceptor aircraft. One of the major problems of using nitrous oxide in a reciprocating engine is that it can produce enough power to damage or destroy the engine. Very large power increases are possible, and if the mechanical structure of the engine is not properly reinforced, the engine may be severely damaged or destroyed during this kind of operation. It is very important with nitrous oxide augmentation of internal combustion engines to maintain proper operating temperatures and fuel levels to prevent "pre-ignition", or "detonation" (sometimes referred to as "knock"). Most problems that are associated with nitrous do not come from mechanical failure due to the power increases. Since nitrous allows a much denser charge into the cylinder it dramatically increases cylinder pressures. The increased pressure and temperature can cause problems such as melting the piston or valves. It may also crack or warp the piston or head and cause pre-ignition due to uneven heating. 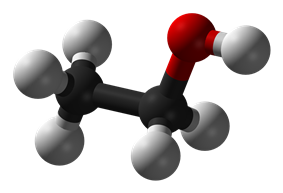 The gas is approved for use as a food additive (also known as E942), specifically as an aerosol spray propellant. Its most common uses in this context are in aerosol whipped cream canisters, cooking sprays, and as an inert gas used to displace oxygen, to inhibit bacterial growth, when filling packages of potato chips and other similar snack foods. The gas is extremely soluble in fatty compounds. In aerosol whipped cream, it is dissolved in the fatty cream until it leaves the can, when it becomes gaseous and thus creates foam. Used in this way, it produces whipped cream four times the volume of the liquid, whereas whipping air into cream only produces twice the volume. If air were used as a propellant, oxygen would accelerate rancidification of the butterfat; nitrous oxide inhibits such degradation. Carbon dioxide cannot be used for whipped cream because it is acidic in water, which would curdle the cream and give it a seltzer-like "sparkling" sensation. However, the whipped cream produced with nitrous oxide is unstable and will return to a more liquid state within half an hour to one hour. Thus, the method is not suitable for decorating food that will not be immediately served. Similarly, cooking spray, which is made from various types of oils combined with lecithin (an emulsifier), may use nitrous oxide as a propellant; other propellants used in cooking spray include food-grade alcohol and propane. Users of nitrous oxide often obtain it from whipped cream dispensers that use nitrous oxide as a propellant (see above section), for recreational use as a euphoria-inducing inhalant drug. It is not harmful in small doses, but risks due to lack of oxygen do exist (see Recreational use below). 2O tanks used in dentistry. Nitrous oxide has been used for anaesthesia in dentistry since December 1844, where Horace Wells made the first 12–15 dental operations with the gas in Hartford. Its debut as a generally accepted method, however, came in 1863, when Gardner Quincy Colton introduced it more broadly at all the Colton Dental Association clinics, that he founded in New Haven and New York City. The first devices used in dentistry to administer the gas, known as Nitrous Oxide inhalers, were designed in a very simple way with the gas stored and breathed through a breathing bag made of rubber cloth, without a scavenger system and flowmeter, and with no addition of oxygen/air. Today these simple and somewhat unreliable inhalers have been replaced by the more modern relative analgesia machine, which is an automated machine designed to deliver a precisely dosed and breath-actuated flow of nitrous oxide mixed with oxygen, for the patient to inhale safely. The machine used in dentistry is designed as a simplified version of the larger anaesthetic machine used by hospitals, as it doesn't feature the additional anaesthetic vaporiser and medical ventilator. The purpose of the machine allows for a simpler design, as it only delivers a mixture of nitrous oxide and oxygen for the patient to inhale, in order to depress the feeling of pain while keeping the patient in a conscious state. Relative analgesia machines typically feature a constant-supply flowmeter, which allow the proportion of nitrous oxide and the combined gas flow rate to be individually adjusted. The gas is administered by dentists through a demand-valve inhaler over the nose, which will only release gas when the patient inhales through the nose. Because nitrous oxide is minimally metabolised in humans (with a rate of 0.004%), it retains its potency when exhaled into the room by the patient, and can pose an intoxicating and prolonged exposure hazard to the clinic staff if the room is poorly ventilated. Where nitrous oxide is administered, a continuous-flow fresh-air ventilation system or nitrous scavenger system is used to prevent a waste-gas buildup. Hospitals administer nitrous oxide as one of the anaesthetic drugs delivered by anaesthetic machines. Nitrous oxide is a weak general anaesthetic, and so is generally not used alone in general anaesthesia. In general anaesthesia it is used as a carrier gas in a 2:1 ratio with oxygen for more powerful general anaesthetic drugs such as sevoflurane or desflurane. It has a minimum alveolar concentration of 105% and a blood/gas partition coefficient of 0.46. The medical grade gas tanks, with the tradename Entonox and Nitronox contain a mixture with 50%, but this will normally be diluted to a lower percentage upon the operational delivery to the patient. Inhalation of nitrous oxide is frequently used to relieve pain associated with childbirth, trauma, oral surgery, and acute coronary syndrome (includes heart attacks). Its use during labour has been shown to be a safe and effective aid for women wanting to give birth without an epidural. Its use for acute coronary syndrome is of unknown benefit. In Britain and Canada, Entonox and Nitronox are commonly used by ambulance crews (including unregistered practitioners) as a rapid and highly effective analgesic gas. Nitrous oxide has been shown to be effective in treating a number of addictions, including alcohol withdrawal. Nitrous oxide is also gaining interest as a substitute gas for carbon dioxide in laparoscopic surgery. It has been found to be as safe as carbon dioxide with better pain relief. Nitrous oxide can cause analgesia, depersonalisation, derealisation, dizziness, euphoria, and some sound distortion. Research has also found that it increases suggestibility and imagination. Inhalation of nitrous oxide for recreational use, with the purpose of causing euphoria and/or slight hallucinations, began as a phenomenon for the British upper class in 1799, known as "laughing gas parties". Until at least 1863, a low availability of equipment to produce the gas, combined with a low usage of the gas for medical purposes, meant it was a relatively rare phenomenon that mainly happened among students at medical universities. When equipment became more widely available for dentistry and hospitals, most countries also restricted the legal access to buy pure nitrous oxide gas cylinders to those sectors. Despite only medical staff and dentists today being legally allowed to buy the pure gas, a Consumers Union report from 1972 found that the use of the gas for recreational purpose was [then] still taking place, based upon reports of its use in Maryland 1971, Vancouver 1972, and a survey made by Dr. Edward J. Lynn of its non-medical use in Michigan 1970. 2O or rebreathed the gas. There were no adverse effects reported in the more than one hundred individuals surveyed. 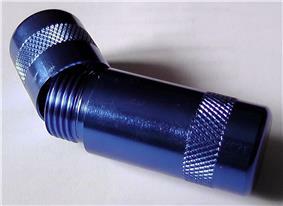 In Australia, nitrous oxide bulbs are known as nangs, possibly derived from the sound distortion perceived by consumers. In the United Kingdom, nitrous oxide is used by almost half a million young people at nightspots, festivals and parties. 2O may act to imitate nitric oxide (NO) in the central nervous system, and this may be related to its analgesic and anxiolytic properties. 2O causes the release of endogenous opioid peptides is still uncertain. 2O stimulates the mesolimbic reward pathway via inducing dopamine release and activating dopaminergic neurons in the ventral tegmental area and nucleus accumbens, presumably through antagonisation of NMDA receptors localised in the system. This action has been implicated in its euphoric effects, and notably, appears to augment its analgesic properties as well. 2O was found to produce mixed responses similarly to rats, reflecting high subjective individual variability. 2O has a very short duration under normal circumstances, it is less likely to be neurotoxic than other NMDA antagonists. Indeed, in rodents, short-term exposure results in only mild injury that is rapidly reversible, and permanent neuronal death only occurs after constant and sustained exposure. Nitrous oxide may also cause neurotoxicity after extended exposure because of hypoxia. This is especially true of non-medical formulations such as whipped-cream chargers (also known as "whippets"), which are not necessarily mixed with oxygen. Additionally, nitrous oxide depletes vitamin B12 levels. This can cause serious neurotoxicity with even acute use if the user has preexisting vitamin B12 deficiency. Nitrous oxide is also neuroprotective, inhibiting glutamate-induced excitotoxicity. The major safety hazards of nitrous oxide come from the fact that it is a compressed liquefied gas, an asphyxiation risk, and a dissociative anaesthetic. Exposure to nitrous oxide causes short-term decreases in mental performance, audiovisual ability, and manual dexterity. Long-term exposure can cause vitamin B12 deficiency, numbness, reproductive side effects (in pregnant females), and other problems (see Biological). The National Institute for Occupational Safety and Health recommends that workers' exposure to nitrous oxide should be controlled during the administration of anaesthetic gas in medical, dental, and veterinary operators. At room temperature (20 °C) the saturated vapour pressure is 58.5 bar, rising up to 72.45 bar at 36.4 °C (97.5 °F)—the organic compounds; liquid mixtures may form shock sensitive explosives. As with many strong oxidisers, contamination of parts with fuels have been implicated in rocketry accidents, where small quantities of nitrous/fuel mixtures explode due to "water hammer"-like effects (sometimes called "dieseling"—heating due to adiabatic compression of gases can reach decomposition temperatures). Some common building materials such as stainless steel and aluminium can act as fuels with strong oxidisers such as nitrous oxide, as can contaminants, which can ignite due to adiabatic compression. There have also been accidents where nitrous oxide decomposition in plumbing has led to the explosion of large tanks. Nitrous oxide inactivates the cobalamin form of vitamin B12 by oxidation. Symptoms of vitamin B12 deficiency, including sensory neuropathy, myelopathy, and encephalopathy, can occur within days or weeks of exposure to nitrous oxide anaesthesia in people with subclinical vitamin B12 deficiency. Symptoms are treated with high doses of vitamin B12, but recovery can be slow and incomplete. People with normal vitamin B12 levels have stores to make the effects of nitrous oxide insignificant, unless exposure is repeated and prolonged (nitrous oxide abuse). Vitamin B12 levels should be checked in people with risk factors for vitamin B12 deficiency prior to using nitrous oxide anaesthesia. A study of workers and several experimental animal studies indicate that adverse reproductive effects for pregnant females may also result from chronic exposure to nitrous oxide. 2O is produced naturally in the soil during the microbial processes of nitrification and denitrification. 2O) emissions. Additionally, estimated emissions from agricultural soils were 6% higher in 2008 than 1990. According to 2006 data from the United States Environmental Protection Agency, industrial sources make up only about 20% of all anthropogenic sources, and include the production of nylon, and the burning of fossil fuel in internal combustion engines. Human activity is thought to account for 30%; tropical soils and oceanic release account for 70%. However, a 2008 study by Nobel Laureate Paul Crutzen suggests that the amount of nitrous oxide release attributable to agricultural nitrate fertilizers has been seriously underestimated, most of which would presumably come under soil and oceanic release in the Environmental Protection Agency data. Atmospheric levels have risen by more than 15% since 1750. Nitrous oxide also causes ozone depletion. A new study suggests that N2O emission currently is the single most important ozone-depleting substance (ODS) emission and is expected to remain the largest throughout the 21st century. Nitrous oxide is most commonly prepared by careful heating of Trenton, New Jersey. This reaction occurs between 170 and 240 °C (338 and 464 °F), temperatures where ammonium nitrate is a moderately sensitive explosive and a very powerful oxidizer. Above 240 °C (464 °F) the exothermic reaction may accelerate to the point of detonation, so the mixture must be cooled to avoid such a disaster. Superheated steam is used to reach reaction temperature in some turnkey production plants. Downstream, the hot, corrosive mixture of gases must be cooled to condense the steam, and filtered to remove higher oxides of nitrogen. Ammonium nitrate smoke, as an extremely persistent colloid, will also have to be removed. The cleanup is often done in a train of three gas washes; namely base, acid and base again. Any significant amounts of nitric oxide (NO) may not necessarily be absorbed directly by the base (sodium hydroxide) washes. The nitric oxide impurity is sometimes chelated out with ferrous sulfate, reduced with iron metal, or oxidised and absorbed in base as a higher oxide. The first base wash may (or may not) react out much of the ammonium nitrate smoke. However, this reaction generates ammonia gas, which may have to be absorbed in the acid wash. It is prepared by heating a mixture of sodium nitrate and ammonium sulphate. Nitrous oxide can be made by heating a solution of sulfamic acid and nitric acid. Many gases are made this way in Bulgaria. There is no explosive hazard in this reaction if the mixing rate is controlled. 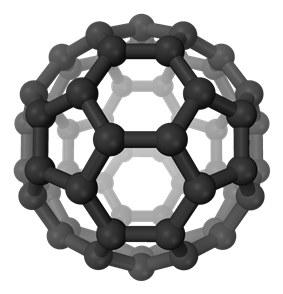 However, as usual, toxic higher oxides of nitrogen are formed. Nitrous oxide is produced in large volumes as a by-product in the synthesis of adipic acid; one of the two reactants used in nylon manufacture. This might become a major commercial source, but will require the removal of higher oxides of nitrogen and organic impurities. Currently much of the gas is decomposed before release for environmental protection. Hyponitrous acid decomposes to N2O and water with a half-life of 16 days at 25 °C at pH 1-3. As this reaction is not reversible, N2O should not be considered as the anhydride of H2N2O2. 2) (e.g., Webster and Hopkins, 1996; Wrage et al., 2001). 2O production mechanisms include heterotrophic nitrification (Robertson and Kuenen, 1990), aerobic denitrification by the same heterotrophic nitrifiers (Robertson and Kuenen, 1990), fungal denitrification (Laughlin and Stevens, 2002), and non-biological process chemodenitrification (e.g. Chalk and Smith, 1983; Van Cleemput and Baert, 1984; Martikainen and De Boer, 1993; Daum and Schenk, 1998; Mørkved et al., 2007). 2O emissions are reported to be controlled by soil chemical and physical properties such as the availability of mineral N, soil pH, organic matter availability, and soil type, and climate related soil properties such as soil temperature and soil water content (e.g., Mosier, 1994; Bouwman, 1996; Beauchamp, 1997; Yamulki et al. 1997; Dobbie and Smith, 2003; Smith et al. 2003; Dalal et al. 2003). Nitrous oxide supports combustion by releasing the dipolar bonded oxygen radical,[Name?] thus it can relight a glowing splint. The above reaction is actually the route adopted by the commercial chemical industry to produce azide salts, which are used as detonators. Nitrous oxide is emitted by bacteria in soils and oceans, and is thus a part of Earth's atmosphere. Agriculture is the main source of human-produced nitrous oxide: cultivating soil, the use of nitrogen fertilisers, and animal waste handling can all stimulate naturally occurring bacteria to produce more nitrous oxide. The livestock sector (primarily cows, chickens, and pigs) produces 65% of human-related nitrous oxide. Industrial sources make up only about 20% of all anthropogenic sources, and include the production of nylon, and the burning of fossil fuel in internal combustion engines. Human activity is thought to account for 30%; tropical soils and oceanic release account for 70%. Nitrous oxide reacts with ozone in the stratosphere. Nitrous oxide is the main naturally occurring regulator of stratospheric ozone. Nitrous oxide is a major greenhouse gas. Considered over a 100-year period, it has 298 times more impact per unit weight than carbon dioxide. Thus, despite its low concentration, nitrous oxide is the fourth largest contributor to these greenhouse gases. It ranks behind water vapour, carbon dioxide, and methane. Control of nitrous oxide is part of efforts to curb greenhouse gas emissions. The gas was first synthesised by English natural philosopher and chemist Joseph Priestley in 1772, who called it phlogisticated nitrous air (see phlogiston). 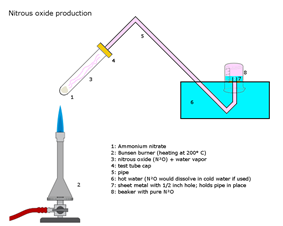 Priestley published his discovery in the book Experiments and Observations on Different Kinds of Air (1775), where he described how to produce the preparation of "nitrous air diminished", by heating iron filings dampened with nitric acid. The machine to produce "Factitious Airs" had three parts: A furnace to burn the needed material, a vessel with water where the produced gas passed through in a spiral pipe (for impurities to be "washed off"), and finally the gas cylinder with a gasometer where the gas produced, "air", could be tapped into portable air bags (made of airtight oily silk). The breathing apparatus consisted of one of the portable air bags connected with a tube to a mouthpiece. With this new equipment being engineered and produced by 1794, the way was paved for clinical trials, which began when Thomas Beddoes in 1798 established the "Pneumatic Institution for Relieving Diseases by Medical Airs" in Hotwells (Bristol). In the basement of the building, a large-scale machine was producing the gases under the supervision of a young Humphry Davy, who was encouraged to experiment with new gases for patients to inhale. The first important work of Davy was examination of the nitrous oxide, and the publication of his results in the book: Researches, Chemical and Philosophical (1800). In that publication, Davy notes the analgesic effect of nitrous oxide at page 465 and its potential to be used for surgical operations at page 556. The first time nitrous oxide was used as an anaesthetic drug in the treatment of a patient was when dentist Horace Wells, with assistance by Gardner Quincy Colton and John Mankey Riggs, demonstrated insensitivity to pain from a dental extraction on 11 December 1844. In the following weeks, Wells treated the first 12–15 patients with nitrous oxide in Hartford, and according to his own record only failed in two cases. In spite of these convincing results being reported by Wells to the medical society in Boston already in December 1844, this new method was not immediately adopted by other dentists. The reason for this was most likely that Wells, in January 1845 at his first public demonstration to the medical faculty in Boston, had been partly unsuccessful, leaving his colleagues doubtful regarding its efficacy and safety. The method did not come into general use until 1863, when Gardner Quincy Colton successfully started to use it in all his "Colton Dental Association" clinics, that he had just established in New Haven and New York City. Over the following three years, Colton and his associates successfully administered nitrous oxide to more than 25,000 patients. Today, nitrous oxide is used in dentistry as an anxiolytic, as an adjunct to local anaesthetic. However, nitrous oxide was not found to be a strong enough anaesthetic for use in major surgery in hospital settings. Being a stronger and more potent anaesthetic, sulfuric ether was instead demonstrated and accepted for use in October 1846, along with chloroform in 1847. When Joseph Thomas Clover invented the "gas-ether inhaler" in 1876, it however became a common practice at hospitals to initiate all anaesthetic treatments with a mild flow of nitrous oxide, and then gradually increase the anaesthesia with the stronger ether/chloroform. Clover's gas-ether inhaler was designed to supply the patient with nitrous oxide and ether at the same time, with the exact mixture being controlled by the operator of the device. It remained in use by many hospitals until the 1930s. Although hospitals today are using a more advanced anaesthetic machine, these machines still use the same principle launched with Clover's gas-ether inhaler, to initiate the anaesthesia with nitrous oxide, before the administration of a more powerful anaesthetic. In the United States, possession of nitrous oxide is legal under federal law and is not subject to DEA purview. It is, however, regulated by the Food and Drug Administration under the Food Drug and Cosmetics Act; prosecution is possible under its "misbranding" clauses, prohibiting the sale or distribution of nitrous oxide for the purpose of human consumption. 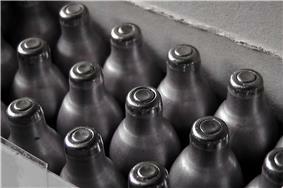 Many states have laws regulating the possession, sale, and distribution of nitrous oxide. Such laws usually ban distribution to minors or limit the amount of nitrous oxide that may be sold without special license. For example, in the state of California, possession for recreational use is prohibited and qualifies as a misdemeanour. In New Zealand, the Ministry of Health has warned that nitrous oxide is a prescription medicine, and its sale or possession without a prescription is an offence under the Medicines Act. This statement would seemingly prohibit all non-medicinal uses of the chemical, though it is implied that only recreational use will be legally targeted. In India, for general anaesthesia purposes, nitrous oxide is available as Nitrous Oxide IP. India's gas cylinder rules (1985) permit the transfer of gas from one cylinder to another for breathing purposes. This law benefits remote hospitals, which would otherwise suffer as a result of India's geographic immensity. Nitrous Oxide IP is transferred from bulk cylinders (17,000 litres [600 cu ft] capacity gas) to smaller pin-indexed valve cylinders (1,800 litres [64 cu ft] of gas), which are then connected to the yoke assembly of Boyle's machines. Because India's Food & Drug Authority (FDA-India) rules state that transferring a drug from one container to another (refilling) is equivalent to manufacturing, anyone found doing so must possess a drug manufacturing license. ^ Tarendash, Albert S. (2001). Let's review: chemistry, the physical setting (3rd ed.). Barron's Educational Series. p. 44. ^ a b "Overview of Greenhouse Gases – Nitrous Oxide". US EPA. Page 164 (document header listing). Retrieved 19 March 2014. ^ "WHO Model List of Essential Medicines" (PDF). World Health Organization. October 2013. p. 6. Retrieved 22 April 2014. 2O"Scaled Composites Safety Guidelines for (PDF). Scaled Composites. 17 June 2009. Retrieved 29 December 2013. For example, N2O flowing at 130 psi in an epoxy composite pipe would not react even with a 2500 J ignition energy input. However, at 600 psi, the required ignition energy was only 6 J. ^ "FireStar Engineering". FireStar Engineering. Retrieved 2009-12-11. ^ "Holley performance products, FAQ for Nitrous Oxide Systems". Holley. Retrieved 2013-12-18. ^ a b c d e Sneader W (2005). Drug Discovery –A History. (Part 1: Legacy of the past, chapter 8: systematic medicine, pp. 74–87) (John Wiley and Sons). ^ a b c Miller AH (1941). "Technical Development of Gas Anesthesia". Anesthesiology journal 2 (4): 398–409. ^ Copeland, Claudia. "Nitrous Oxide Analgesia for Childbirth". Pregnancy.org. ^ O'Connor RE, Brady W, Brooks SC, Diercks, D., Egan, J., Ghaemmaghami, C., Menon, V., O'Neil, B. J., Travers, A. H. (2010). "Part 10: acute coronary syndromes: 2010 American Heart Association Guidelines for Cardiopulmonary Resuscitation and Emergency Cardiovascular Care". Circulation 122 (18 Suppl 3): S787–817. ^ Gillman, M. A.; Lichtigfeld, F. J. (2004). "Enlarged double-blind randomised trial of benzodiazepines against psychotropic analgesic nitrous oxide for alcohol withdrawal". Addictive Behaviors 29 (6): 1183–1187. ^ Rammohan A, Manimaran AB, Manohar RR, Naidu RM; Manimaran; Manohar; Naidu (2011). "Nitrous oxide for pneumoperitoneum: no laughing matter this! A prospective single blind case controlled study". Int J Surg. 9 (2): 173–6. ^ Rammohan, A.; Manimaran, A. B.; Manohar, R. R.; Naidu, R. M. (2011). "Nitrous oxide for pneumoperitoneum: No laughing matter this! A prospective single blind case controlled study". International Journal of Surgery 9 (2): 173–176. ^ Giannini, A. J. (1991). "Volatiles". In Miller, N. S. Comprehensive Handbook of Drug and Alcohol Addiction. New York: Marcel Dekker. p. 396. ^ Whalley MG, Brooks GB; Brooks (2009). "Enhancement of suggestibility and imaginative ability with nitrous oxide". Psychopharmacology (Berl). 203 (4): 745–52. ^ a b Brecher EM (1972). "Consumers Union Report on Licit and Illicit Drugs, Part VI – Inhalants and Solvents and Glue-Sniffing". Consumer Reports Magazine. Retrieved 2013-12-18. ^ a b Lynn, Edward J.; Walter, Richard G.; Harris, Lance A.; Dendy, Robert; James, Mary (1972). "Nitrous Oxide: It's a Gas". Journal of Psychoactive Drugs (Journal of Psychedelic Drugs) 5: 1. ^ "Warning over laughing gas misuse". ^ a b Yamakura T, Harris RA; Harris (2000). "Effects of gaseous anaesthetics nitrous oxide and xenon on ligand-gated ion channels. Comparison with isoflurane and ethanol". Anesthesiology 93 (4): 1095–101. ^ Mennerick S, Jevtovic-Todorovic V, Todorovic SM, Shen W, Olney JW, Zorumski CF; Jevtovic-Todorovic; Todorovic; Shen; Olney; Zorumski (1998). "Effect of nitrous oxide on excitatory and inhibitory synaptic transmission in hippocampal cultures". Journal of Neuroscience 18 (23): 9716–26. ^ Gruss M, Bushell TJ, Bright DP, Lieb WR, Mathie A, Franks NP; Bushell; Bright; Lieb; Mathie; Franks (2004). "Two-pore-domain K+ channels are a novel target for the anesthetic gases xenon, nitrous oxide, and cyclopropane". Molecular Pharmacology 65 (2): 443–52. ^ a b Emmanouil DE, Quock RM; Quock (2007). "Advances in Understanding the Actions of Nitrous Oxide". Anesthesia Progress 54 (1): 9–18. ^ Emmanouil, D. E., Johnson, C. H. & Quock, R. M.; Johnson; Quock (1994). "Nitrous oxide anxiolytic effect in mice in the elevated plus maze: mediation by benzodiazepine receptors". Psychopharmacology 115 (1–2): 167–72. ^ Zacny, J.P., Yajnik, S., Coalson, D., Lichtor, J.L., Apfelbaum, J.L., Rupani, G., Young, C., Thapar, P. & Klafta, J.; Yajnik; Coalson; Lichtor; Apfelbaum; Rupani; Young; Thapar; Klafta (1995). "Flumazenil may attenuate some subjective effects of nitrous oxide in humans: a preliminary report". Pharmacology Biochemistry and Behavior 51 (4): 815–9. ^ Berkowitz, B. A., Finck, A. D., Hynes, M. D. & Ngai, S. H.; Finck; Hynes; Ngai (1979). "Tolerance to nitrous oxide analgesia in rats and mice". Anesthesiology 51 (4): 309–12. ^ a b Branda, E. M., Ramza, J. T., Cahill, F. J., Tseng, L. F. & Quock, R. M.; Ramza; Cahill; Tseng; Quock (2000). "Role of brain dynorphin in nitrous oxide antinociception in mice". Pharmacology Biochemistry and Behavior 65 (2): 217–21. ^ Guo, T. Z., Davies, M. F., Kingery, W. S., Patterson, A. J., Limbird, L. E. & Maze, M.; Davies; Kingery; Patterson; Limbird; Maze (1999). "Nitrous oxide produces antinociceptive response via alpha2B and/or alpha2C adrenoceptor subtypes in mice". Anesthesiology 90 (2): 470–6. ^ Sawamura, S., Kingery, W. S., Davies, M. F., Agashe, G. S., Clark, J. D., Koblika, B. K., Hashimoto, T. & Maze, M.; Kingery; Davies; Agashe; Clark; Kobilka; Hashimoto; Maze (2000). "Antinociceptive action of nitrous oxide is mediated by stimulation of noradrenergic neurons in the brainstem and activation of [alpha]2B adrenoceptors". J. Neurosci. 20 (24): 9242–51. ^ Maze M, Fujinaga M; Fujinaga (2000). "Recent advances in understanding the actions and toxicity of nitrous oxide". Anaesthesia 55 (4): 311–4. ^ a b Sakamoto S, Nakao S, Masuzawa M, Inada, Takefumi, Maze, Mervyn, Franks, Nicholas P., Shingu, Koh (2006). "The differential effects of nitrous oxide and xenon on extracellular dopamine levels in the rat nucleus accumbens: a microdialysis study". Anesthesia and Analgesia 103 (6): 1459–63. ^ a b Benturquia N, Le Marec T, Scherrmann JM, Noble F; Le Marec; Scherrmann; Noble (2008). "Effects of nitrous oxide on dopamine release in the rat nucleus accumbens and expectation of reward". Neuroscience 155 (2): 341–4. ^ a b Lichtigfeld FJ, Gillman MA; Gillman (1996). "Role of dopamine mesolimbic system in opioid action of psychotropic analgesic nitrous oxide in alcohol and drug withdrawal". Clinical Neuropharmacology 19 (3): 246–51. ^ a b Koyanagi S, Himukashi S, Mukaida K, Shichino T, Fukuda K; Himukashi; Mukaida; Shichino; Fukuda (2008). "Dopamine D2-like receptor in the nucleus accumbens is involved in the antinociceptive effect of nitrous oxide". Anesthesia and Analgesia 106 (6): 1904–9. ^ David HN, Ansseau M, Lemaire M, Abraini JH; Ansseau; Lemaire; Abraini (2006). "Nitrous oxide and xenon prevent amphetamine-induced carrier-mediated dopamine release in a memantine-like fashion and protect against behavioral sensitization". Biological Psychiatry 60 (1): 49–57. ^ a b Benturquia N, Le Guen S, Canestrelli C, Lagente, V., Apiou, G., Roques, B.P., Noble, F. (2007). "Specific blockade of morphine- and cocaine-induced reinforcing effects in conditioned place preference by nitrous oxide in mice". Neuroscience 149 (3): 477–86. ^ Ramsay DS, Watson CH, Leroux BG, Prall CW, Kaiyala KJ; Watson; Leroux; Prall; Kaiyala (2003). "Conditioned place aversion and self-administration of nitrous oxide in rats". Pharmacology, Biochemistry, and Behavior 74 (3): 623–33. ^ Wood RW, Grubman J, Weiss B; Grubman; Weiss (1977). "Nitrous oxide self-administration by the squirrel monkey". The Journal of Pharmacology and Experimental Therapeutics 202 (3): 491–9. ^ Zacny JP, Galinkin JL; Galinkin (1999). "Psychotropic drugs used in anesthesia practice: abuse liability and epidemiology of abuse". Anesthesiology 90 (1): 269–88. ^ Dohrn CS, Lichtor JL, Coalson DW, Uitvlugt A, de Wit H, Zacny JP; Lichtor; Coalson; Uitvlugt; De Wit; Zacny (1993). "Reinforcing effects of extended inhalation of nitrous oxide in humans". Drug and Alcohol Dependence 31 (3): 265–80. ^ Walker DJ, Zacny JP; Zacny (2001). "Within- and between-subject variability in the reinforcing and subjective effects of nitrous oxide in healthy volunteers". Drug and Alcohol Dependence 64 (1): 85–96. ^ a b Jevtovic-Todorovic V, Beals J, Benshoff N, Olney JW; Beals; Benshoff; Olney (2003). "Prolonged exposure to inhalational anesthetic nitrous oxide kills neurons in adult rat brain". Neuroscience 122 (3): 609–16. ^ Nakao S; Nagata A; Masuzawa M; Miyamoto, E; Yamada, M; Nishizawa, N; Shingu, K (2003). "NMDA receptor antagonist neurotoxicity and psychotomimetic activity". Masui. the Japanese Journal of Anesthesiology (in Japanese) 52 (6): 594–602. ^ Jevtovic-Todorovic V, Benshoff N, Olney JW; Benshoff; Olney (2000). "Ketamine potentiates cerebrocortical damage induced by the common anaesthetic agent nitrous oxide in adult rats". British Journal of Pharmacology 130 (7): 1692–8. ^ Jevtovic-Todorovic V, Carter LB; Carter (2005). "The anesthetics nitrous oxide and ketamine are more neurotoxic to old than to young rat brain". Neurobiology of Aging 26 (6): 947–56. ^ Slikker, W.; Zou, X.; Hotchkiss, C. E.; Divine, R. L.; Sadovova, N.; Twaddle, N. C.; Doerge, D. R.; Scallet, A. C.; Patterson, T. A.; Hanig, J. P.; Paule, M. G.; Wang, C. (2007). "Ketamine-Induced Neuronal Cell Death in the Perinatal Rhesus Monkey". Toxicological Sciences 98 (1): 145–158. ^ Sun, Lin; Qi Li; Qing Li; Yuzhe Zhang; Dexiang Liu; Hong Jiang; Fang Pan; David T. Yew (November 2012). "Chronic ketamine exposure induces permanent impairment of brain functions in adolescent cynomolgus monkeys". Addiction Biology 19 (2): 185–94. ^ Abraini JH, David HN, Lemaire M; David; Lemaire (2005). "Potentially neuroprotective and therapeutic properties of nitrous oxide and xenon". Annals of the New York Academy of Sciences 1053: 289–300. ^ De Vasconcellos, K; Sneyd, J. R. (2013). "Nitrous oxide: Are we still in equipoise? A qualitative review of current controversies". British Journal of Anaesthesia 111 (6): 877–85. ^ Flippo, T. S.; Holder Jr, W. D. (1993). "Neurologic Degeneration Associated with Nitrous Oxide Anesthesia in Patients with Vitamin B12 Deficiency". Archives of Surgery 128 (12): 1391–5. ^ "Safetygram 20: Nitrous Oxide". Airproducts.com. Archived from the original on 2006-09-01. ^ Giannini, A.J. (1999). Drug Abuse. Los Angeles: Health Information Press. ^ Conrad, Marcel (2006-10-04). "Pernicious Anemia". Retrieved 2008-06-02. ^ Rowland, A.S.; Baird, D.D. ; Weinberg, C.R. ; Shore, D.L. ; Shy, C.M. ; Wilcox, A.J. (1992). "Reduced fertility among women employed as dental assistants exposed to high levels of nitrous oxide". The New England Journal of Medicine 327 (14): 993–7. ^ a b Vieira, E.; Cleaton-Jones, P.; Austin, J.C.; Moyes, D.G. ; Shaw, R. (1980). "Effects of low concentrations of nitrous oxide on rat fetuses". Anesthesia and Analgesia 59 (3): 175–7. ^ Vieira, E. (1979). "Effect of the chronic administration of nitrous oxide 0.5% to gravid rats". British journal of anaesthesia 51 (4): 283–7. ^ Vieira, E; Cleaton-Jones, P; Moyes, D. (1983). "Effects of low intermittent concentrations of nitrous oxide on the developing rat fetus". British journal of anaesthesia 55 (1): 67–9. ^ "40 CFR Part 98 - Revisions to the Greenhouse Gas Reporting Rule and Final Confidentiality | U.S. EPA". Environmental Protection Agency. 2013-11-15. Retrieved 2014-03-19. ^ Sloss, Leslie L. (1992). Nitrogen Oxides Control Technology Fact Book. William Andrew. p. 6. ^ a b "2011 U.S. Greenhouse Gas Inventory Report | Climate Change – Greenhouse Gas Emissions | U.S. EPA". Epa.gov. Retrieved 2011-04-11. ^ "FULL TEXT OF THE CONVENTION, ARTICLE 4(1) (a)". Unfccc.int. 1998-12-31. Retrieved 2011-04-11. 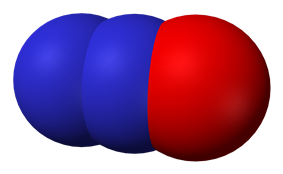 ^ a b "Sources and Emissions – Where Does Nitrous Oxide Come From?". U.S. Environmental Protection Agency. 2006. Retrieved 2008-02-02. ^ Crutzen, P. J.; Mosier, A. R.; Smith, K. A.; Winiwarter, W. (2008). "N2O release from agro-biofuel production negates global warming reduction by replacing fossil fuels". Atmospheric Chemistry and Physics 8 (2): 389. ^ "Climate Change 2007: The Physical Sciences Basis". ^ Ravishankara, A. R.; Daniel, J. S.; Portmann, R. W. (2009). 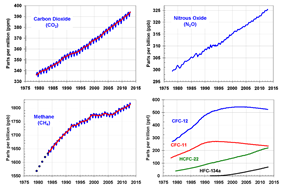 "Nitrous Oxide (N2O): The Dominant Ozone-Depleting Substance Emitted in the 21st Century". Science 326 (5949): 123–5. ^ Grossman, Lisa (28 August 2009). "Laughing gas is biggest threat to ozone layer". NewScientist. ^ Holleman, A. F.; Wiberg, E. (2001). Inorganic Chemistry. San Diego: Academic Press. ^ "Nitrous oxide plant". Sanghi Organization. Retrieved 2013-12-18. ^ Suwa T, Matsushima A, Suziki Y and Namina Y (1961). "Synthesis of Nitrous Oxide by Oxidation of Ammonia". Kohyo Kagaku Zasshi, Showa Denka Ltd. 64: 1879–1888. ^ Reimer R. A.; Slaten C. S.; Seapan M.; Lower M. W.; Tomlinson P. E.; (1994). "Abatement of N2O emissions produced in the adipic acid industry". Environmental progress 13 (2): 134–137. ^ Shimizu, A.; Tanaka, K. and Fujimori, M. (2000). "Abatement of N2O emissions produced in the adipic acid industry". Chemosphere – Global Change Science 2 (3–4): 425–434. ^ Housecroft, Catherine E. and Sharpe, Alan G. (2008). "Chapter 15: The group 15 elements". Inorganic Chemistry (3rd ed.). Pearson. p. 464. ^ Steinfeld, H.; Gerber, P.; Wassenaar, T.; Castel, V.; Rosales, M. and de Haan, C. (2006). "Livestock's long shadow – Environmental issues and options". Fao.org. Retrieved 2008-02-02. ^ "4.1.1 Sources of Greenhouse Gases". IPCC TAR WG1 2001. Retrieved 21 September 2012. ^ Keys, T.E. (1941). "The Development of Anesthesia". Anesthesiology 2 (5): 552–574. ^ Priestley J (1776). "Experiments and Observations on Different Kinds of Air" 2 (3). ^ Erving, H. W. (1933). "The Discoverer of Anæsthesia: Dr. Horace Wells of Hartford". The Yale journal of biology and medicine 5 (5): 421–430. ^ Desai SP, Desai MS, Pandav CS (2007). "The discovery of modern anaesthesia-contributions of Davy, Clarke, Long, Wells and Morton". Indian J Anaesth 51 (6): 472–8. ^ Anderton, Jim (26 June 2005). "Time's up for sham sales of laughing gas". Beehive.govt.nz.